I came up with this recipe the other day and could not wait to try it. I honestly woke up dreaming about all these fall flavors! This is a super easy, healthy and delicious meal for Mommy and Daddy. If you have already tried nuts with your little one (12+ months) you can serve this to them too. Preheat oven to 425F. Put 1 cup slivered almonds in a food processor or blender and blend until they look like bread crumbs. Put almond crumbs in a bowl and add salt and pepper and mix. Dredge chicken through seasoned almond mixture and place in a deep baking dish. Peel and chop sweet potatoes into cubes. Put in a large mixing bowl. 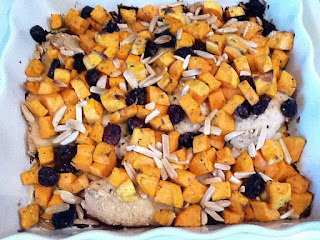 Add dried cranberries, 1 tblsp olive oil, 1 tblsp maple syrup, sage, Herbs de Provence, pumpkin pie spice, salt and pepper. Toss to coat. Pour over chicken and then sprinkle with a handful of slivered almonds. Drizzle with olive oil. Bake for 35-40 minutes. Serve and enjoy!